Medical and Audiological Protocol for Selection and Evaluation for Vibrant Soundbridge®, Surgically Implantable Middle Ear Device. Abstract: Currently, individuals with moderate to severe hearing loss, sensorineural type, mixed or conductive can benefit from different types of hearing devices, external or surgically implantable to their rehabilitation. The benefits of implantable hearing device are directly related to an accurate evaluation of pre-operative medical and audiological criteria. Objective: To describe the protocol of ENT and audiological evaluation of the candidates submitted to Vibrant Soundbridge hearing device implant in the middle ear at HCFMUSP (Medical School Hospital). Conclusion: An example of specific evaluation followed by medical and audiological team determines the necessary profile and criteria of the candidates to hearing aid implant in the middle ear. Audition is one of the most important communication channels of human beings with exterior world. It is through audition that individuals receive information of sound world and develop their cognitive and psychosocial abilities. Auditory, sensory-neural, mixed or conductive loss of moderate to sever degree can affect individuals in several steps of their lives causing direct and/or indirect harms(1). The (re)habilitation process immediately after diagnosis tends o minimize such harms and insert the individual socially. 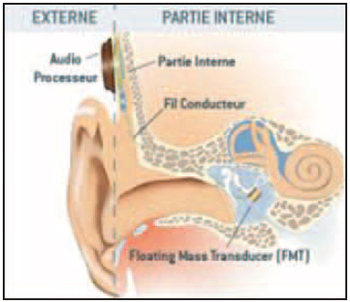 External hearing aid technology evoluted fast in the last decade, becoming widely indicated for several configurations of auditory loss, including for losses with higher auditory residue in grave frequencies(2). However, patients with sensory-neural auditory loss with higher loss in acute frequencies frequently report low sound quality while patients carrying mixed or conductive auditory loss report physical discomfort of the prosthesis, infections caused by mold and intolerance as the main reasons why they quit its use(3). As an alternative of the intervention process, the implantable hearing aid of middle ear was approved in Europe after the European Directive Board established, in June 1990, the regulating rules for its safe use (AIMD 90/385/EEC) (4) and in August 2000 in the USA for its clinical use (5,6). In Brazil, such device was regulated by Anvisa in 2007. The Ororrhinolaryngological Clinical Division of Hospital das Clínicas da Faculdade de Medicina da Universidade de São Paulo has been working with the technical-scientific improvement of the cochlear implant since 1989. It started this technical and scientific study to offer the Vibrant middle ear implant as one more rehabilitation hearing resource. The implantable hearing aid of middle ear was initially used to treat adults carrying moderate to severe sensory-neural auditory loss with contra-indication or rejection of external hearing aids (8). Currently, its indication includes moderate conductive and/or mixed loss (9). The Vibrant SoundbridgeR equipment is middle ear surgically implantable hearing aid basically made of two parts, an external one, called "digital audio processor", made of: omnidirectional microphone, signal processor and battery, and other inner part which is implanted that transmits the signal called Vibranting Ossicular Prothesis - VORP, made of: demodulator package, receptor, conductive link and by the Floating Mass Transducer which is used to transform the amplified sound into vibration, imitating the movement of the ossicle chain in response of the sound stimulus(2,4,5,7,8). The general functioning of Vibrant Soundbridge is based on the sound transmission by the audio processor, through the skin, to the VORP inner receptor(2,5,9), according to picture 1. The most accurate medical and audiologic evaluation criteria benefit the prognosis of the individual to receive the implant and assist the surgeons when taking the decision of the Floating Mass Transducer position, in the round window or in the long crus of the incus. In cases of conductive or mixed loss, the transducer localization is done in a way which is different from the sensory-neural auditory loss(8). It may be directly put on the round window or together with middle ear passive prosthesis, such as titanium ossicular prosthesis stapedectomy piston. CT scan becomes essential for the surgical planning(7,8). Although last decade's world studies refer the use of middle ear implantable hearing aids, such technique is recent in Brazil. This study aims at describing the medical, audiologic, objective and subjective evaluation criteria(5) according to the specific considerations of the team, thus considering the middle ear implantable hearing aid one more alternative in the rehabilitation process of patients carrying hearing loss. The protocol described below is used by the HCFMUSP team and may vary according to different research centers.  carry auditory loss with stable thresholds in the last 2 years.  vocal test with result higher than 52% for word recognition in free filed test situation with auditory prosthesis. The audiologic evaluation must be recorded in details in order to help the patient's selection and follow-up, in case the candidate receives the implant. 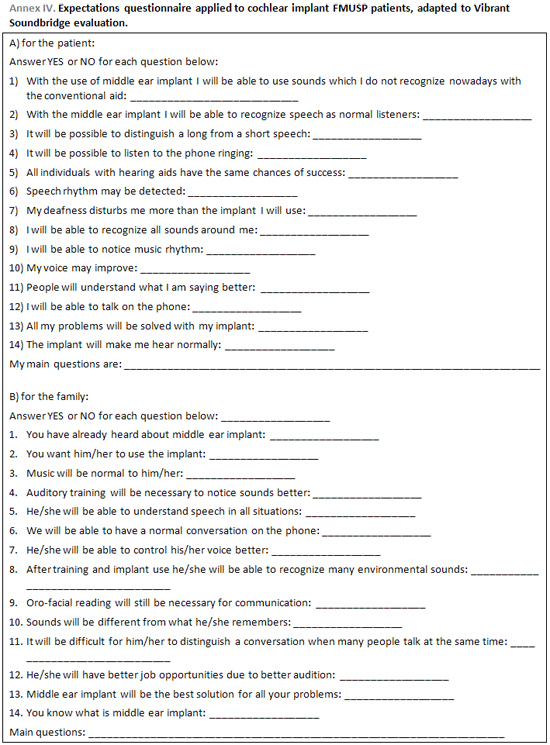  Expectations questionnaire applied to cochlear implant FMUSP patients, adapted to Vibrant Soundbridge evaluation. Considering the Vibrant Soundbridge middle ear implant prosthesis as an alternative for the Auditory, sensory-neural, mixed or conductive loss of moderate to sever degree team work becomes essential for a better diagnosis(2). Detailed medical evaluation with audiologic evaluation support enables the surgeon to define in the pre-operative phase the best place for the positioning of the Floating Mass Transducer(2,3), in addition to a higher control in the post-operative phase. Among the most relevant medical considerations, it is important to point out the importance of CT scan, for the structural evaluation of the region which will receive the implantable prosthesis(10) and previous experience with external auditory prosthesis, which must be negative(13,14), as essential information before surgical decision. In case of neurosensorial auditory loss, the audiologic diagnosis must be complemented with the imitanciometric result present A kind tympanometric curve(4). 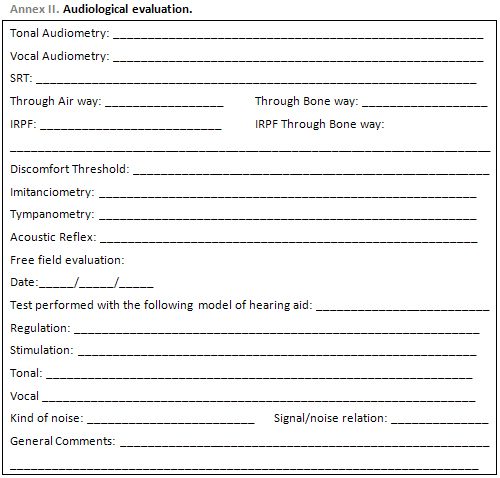 For the mixed and conductive auditory loss, the vocal Audiometry must be done by both air and bone transducer(9). 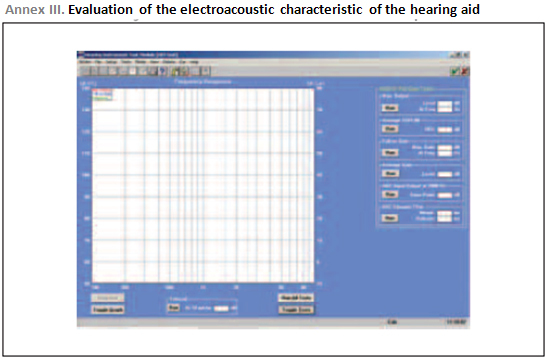 The auditory evaluation in field with and without hearing aid in silence and noise will measure if the patient has speech recognition higher than 52% when evaluated in the 65 dBNPS at silence and noise(10,12,13,14) . 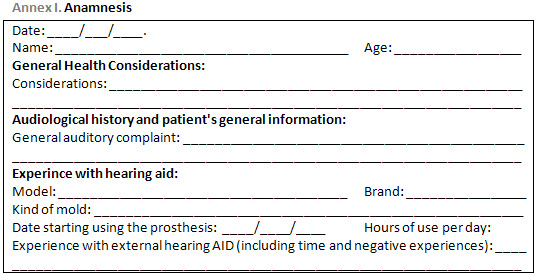 The result of auditory discrimination higher than 53% without hearing aid in silence situation suggests relative post-surgical satisfaction degree when the prosthesis is implanted in the evaluated ear(10) with a possibility of sound perception and gain for sounds which come from the patient's front when it is complemented with binaural adaptation with auditory prosthesis as technological as Vibrant Soundbridge in the contra-lateral ear (11). The data found in the accurate evaluation enables the surgeon to complement the clinical and image examinations(5), the choice of the side to be implanted (3), to provide data so that the candidate has a real or approximate expectation concerning the post-surgical result(5) as well as to obtain data for the programming of the audio processor of the middle ear implantable prosthesis. The criteria defined by the team aim at offering the population one more alternative of hearing loss treatment pointing technical considerations based on scientific studies of reference centers. 1. Carmen R. The Consumer Handbook. Hearing Loss and Hearing Aids. 2nd ed. Sedona, Arizona: Auricle Ink Publishers; 2004. 2. Snik FM, Van Dujinhoven NTL, Mylanus EAM, Cremers CWRJ. Estimated Cost-effectiviness of active middle-ear implantation in hearing patients with several external otitis. Arch otolaryngol head neck surg.2006;132:1210-15. 3. Fish U, Cremers C,Lenarz T, Weber B, Babighian, Uziel A, Proops D, O´Connor A, Charachon R, Helms J, Fraysse B.Clinical experience with the Vibrant Soundbradge implant device. 2001; 22:962-92. 4. Wood MW, Hough JVD. Implantable hearing device: contemporary options. Otology & neurotology. 2002; 10(5):350-4. 5. Sterkers O, Boucarra D, Labassi S, Bebear JP, Dubreil C, Frachet B, Fraysse B, Lavieille JP, Magnan J,Martin C, Truy E, Uziel, Vaneecloo F. A middle ear implant , the Symphonix Vibrant Soundbridge: retrospective study of the first 125 patients implanted in France. Otology and neurotology. 2003; 24:427-36. 6. Soundbridge product Q&A. available from: www.vibrantmedel. com [cited sep 2007]. 7. Gomez V, Guedes M, Sant.Anna S, Peralta C, Tsuji R, Castilho A, Brito Neto R, Bento R. Critérios de seleção e avaliação médica e audiológica dos candidatos ao impante coclear: protocolo HC-FMUSP. Arq. Otorrinolaringol.2004; l8(4):295-321. 8. Huber A, Ball G, Veraguth D, Diller N, Bodmer D, Sequeira D. A new implatable middle ear hearing device for mixed hearing loss: A feasibility study in human temporal bones.Otology & neurotology. 2006; 27:1104-09. 9. Aigner E, Maier H, Tish M. New developments in middle ear implants. Available from: www.vibrant-medel.com [cited oct 2007]. 11. Garin P, thill MP, Gerard JM, Galle C, Gersdorff M. Speech discrimination in background noise with the Vibrant Soundbridge® middle ear implant.Otorrinolaringol. Nova .2002-03;12(3):119-23. 12. Schmuziger N, Schimman F, àWengen D, Patscheke J, Probst R. Long-term assessment after implantation of the Vibrant Soundbridge® device.Otology and neurotology. 2005; 27(2):83-90. 13. Saliba I, Calmels MN, Wanna G,Iversenc G,James C, Deguine O, Fraysse B. Binaurality in middle ear implant recipients using contralateral digital hearing aids. Otology and Neurotology.2005; 26(4):680-9. 14. Fraysse B, Lavieille J, Schmerber S, Véronique E, Truy E,Vicent C,Vaneecloo FM, Sterceks O. Multicenter study of the vibrtan Soundbridge middle ear implant: early clinical results and experience.Otology and neurotology. 2001;22(6):952-67. 15. Todt I, Seidl R, Ernest A.Hearing benefit of patients after Vibrant SoundbridgeR Implantation..ORL. 2005; 67:203-6. 1. Docotr's degree student by FMUSP. Speech Therapist - Otorrhinolaryngology Foundation. 2. Medical Doctor. Otorrhinolaryngology Third-year resident at HCFM/USP. 3. Otorrhinolaryngologist. Scientific complementation apprentice on Skull base and Otological Surgery at MCFMU/SP. This article was submitted at SGP (Publication Management System) of R@IO on November 19, 2007 and approved on March 3rd, 2008 21:50:28.